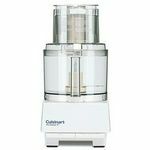 Take your culinary skills to the next level with the machine that raises the bar for counter top food processors. Comes in either black, white or die cast base to coordinate with any kitchen dÃ©cor. Includes: 4-cup work bowl 12-cup work bowl Stainless steel adjustable slicing disc Stainless steel reversible shredding disc (medium/fine) Small stainless steel chopping/mixing blade Large stainless steel chopping/mixing blade Dough blade Spatula Recipe/instruction book ; Use the large 12-cup work bowl or the smaller 4-cup work bowl depending on the task at hand. Innovative SealTight Advantage System seals bowls and locks blades securely. Cuisinart Supreme Wide-Mouth feed-tube and cover assembly allows the addition of whole fruits and vegetables. 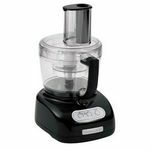 Powerful 1000-watt motor makes quick work of any food preparation task. Simple On/Off and Pulse fingertip touch-pad controls. No-fuss on/off locking system with push button release. All removable parts are dishwasher safe. Model number: FP-12BK (Black), FP-12DC (Die Cast), FP-12 (White) ; Dimensions: 7.3 wide x 17.0 high x 9.5 deep. Weight: 14.0 lbs. Easy to use, mixes small and large projects. Easy to clean and use. I use this product for crushing items like corn, carrots and peas. It works very well when I make guacamole from fresh avocados also. It is easy to clean, and just a little loud when used. Does the job well and fast results. 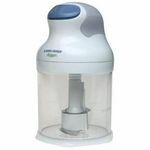 Cuisinart Smart Stick PowerTrio High-Torque Hand Blender is easy to assemble, easy to wash, excellent for milkshakes and home ice creams.It is powerful enough for a multitude of tasks.I have used this on soups, sauces and drinks. No loss of power and so convenient. I like the power of this stick blender and also the Cuisinart name I trust a bit more than the others I ever heard of. I bought it because I trust it will last longer that the others. The bowl is exactly what I wanted. I guessed I had needed such this container.Easy to clean. I'm so happy I bought this. If you're looking for a hand blender, you can't go wrong with this one!Well built and they aren't joking about the high Torque. I bought this to make Low Carb / Paleo mayonnaise . Wow faster than my old hand stick blender. The other attachments are just a happy gift. Like the whisk and the chopper and measure cup.I really enjoy this tool ,it has all the right attachments that makes it great for multiple uses.It is an appropriate as a present to a friend.I bought it for my father in law,because he loves it.. he cooks a lot and it is suitable for living alone.It is just what i wanted. 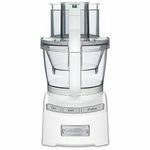 The blender is quite attractive in design and is also very light weight. It does not feel bulky while holding in hands and also not leaky like some of the blenders. Great if used as a primary blender. It also does not consume too much power. Blending Power It is extremely fast and blends items wonderfully well. It does not give such an impression when you first use it. Versatile It is extremely versatile compared to other bulky blenders and cooks various foods amazingly fast. Ease of Use It is very easy to use. Just push the button and it's start blending items you put in. Ease of Cleaning It is very easy to clean as nothing gets struck in the blender. Durability It is strong and durable. It has the capability to beat any bulky blender when it comes to durability. 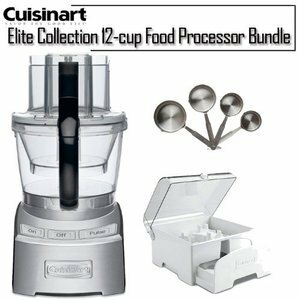 I ordered the Cuisinart Elite Collection 12-cup food processor for myself a couple of months ago - and I am in love with this thing. Prior to this, I just had a small 4-cup food processor, which worked well, but just wasn't big enough for some of the jobs I needed to handle. The bowl size (12-cup) is perfect for really anything you could imagine cooking. It mixes quickly and quietly, and I love that you can simply turn it on and let it do the work and come back to it. My smaller 4-cup food processor required me to hold the button down the entire time, and if I let go it would stop. That is a MAJOR bonus for me with this food processor. It is nice to be able to throw what you need in there, walk away and come back to a job well done. It's fairly easy to clean, and all of the accessories that came with it really are awesome. I haven't even used some of them yet - and I cook every day. This is an extremely versatile product and it seems very heavy-duty. This thing is pretty heavy and a little difficult to store due to its large size, but really - aren't all larger kitchen appliances kind of a pain to store? Overall, I love this item and really don't know how I got along with out it. It makes my daily cooking tasks so much easier - and even a bit more fun! Get this! You won't be sorry. 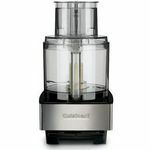 I love this Cuisinart Smart Stick PowerTrio High-Torque Hand Blender very much. I have been using this for last 5-6 years. It is so easy to clean, very efficient. I start my day by using this to make my iced coffee. I tried another brands but none of them was as efficient and easy to us like this. Most of my similar blenders (stick) went bad in just a year or so. I use this to make cold beverages (I don't need to use bid blenders because of this one), chop vegetables to make salsa etc. I can not imagine my morning without this one. When I travel, when I don't have this one with me, I miss it to make my iced coffee. I have strong mixed feelings about the Cuisinart Smart Stick PowerTrio High-Torque Hand Blender. One one hand, it's extremely convenient when I need to quickly shred cheese, whip up a quick guacamole, chop garlic or whip some cream and don't want to hassle with pulling out the bigger appliances. It has plenty of power for such a handy little device too. But I'm a stickler for cleanliness (especially in the kitchen) and I really don't like the fact that the lid to the chopper/grater (which does come into contact with food) can't be washed. I don't mean it can't go in the dishwasher, I mean it can't be washed at all! Not even handwashed. The instructions just say to wipe it off. I wipe it with sterilizing wipes to be safe, which I hope isn't leaving any chemical residue on the food but it seems less dangerous than food-born bacteria. In short, I love the Cuisinart Smart Stick PowerTrio High-Torque Hand Blender, but I don't love food poisoning. Great for more than just food! I love this hand blender! I had originally purchased it to use for making baby food. I highly recommend using it instead of something like the baby bullet that is more expensive and can only be used for making baby food. I just steamed the veggies and used this hand blender to make my baby food. When my son grew out of the baby food stage, I thought i really wouldn't use this blender any more, but I was wrong. One day, while I was making my homemade body butter with coconut oil, I was whipping it with a whisk and got the idea to use this hand blender instead. It worked great! Now I use it for all of my homemade bath and body products. It works so much better than a whisk and is easier to clean than using a regular blender. I love it. Blending Power This little thing has a lot of power. You will be surprised. Versatility Extremely versatile. I have used this blender for everything from homemade baby food to my homemade bath and body products. It works equally well for both ends of the spectrum. Ease of Cleaning Hand blenders are so much easier to clean than regular blenders. Just immerse it into some warm water and run it until it comes clean.